If any other team mobbed the court and jumped for joy after a mid-season victory like the Occidental men’s tennis team Feb. 23 against Hope International, it would seem unsportsmanlike. For the Tiger men, the celebration was justified. This was their first win since May 2, 2015, though the Tigers benefitted from a nose-poking incident. Last year was a trying year for the Tigers, as they went the whole season without a win. Their slump can be attributed to the difficult circumstances the team faced. In addition to changing head coaches in 2016, the team lost its six core starters — nearly all of the team’s upper-division players. According to Erik Silverness (junior), three graduated, two transferred and one stopped playing. Combined with a small recruiting class, they needed to hold open tryouts to even field a team. Trevor Brown, the team’s only senior, agreed with Coe. He said that despite the team’s record, last season was still successful in building a strong group and cohesive unit. In addition to seven new first-year players, the team has committed to training harder. They have adopted a more rigorous training regimen, lifting more often and practicing longer hours. The men also practice with the women’s team, as head coach Ghia Godfree oversees both teams. After losing their first two matches of the season, the Tigers were restless, and the matchup against Hope International was a close one. 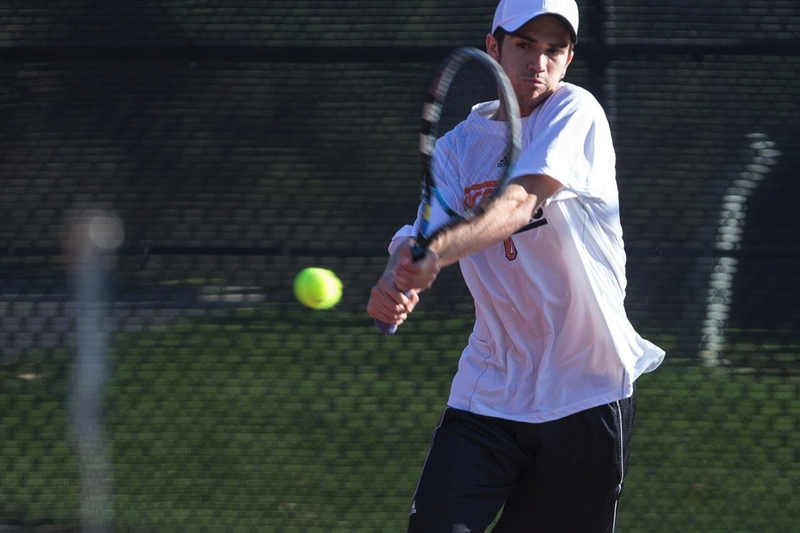 It seemed that — in addition to better preparation — they benefitted from an unusual turn of events, specifically in Coe’s and Isaiah Bird’s (first year) doubles match. Before the match, one of Coe and Bird’s opponents kept taunting them and making repeated back-handed comments. Finally, Coe said he rolled his eyes and muttered “shut up” under his breath — barely audibly. In response, the opponent cursed at him, threw his racquet on the ground, climbed over the fence and began yelling in Coe’s face. Coe knew that his opponent would forfeit the match if his opponent made physical contact him, and refused to react. Despite the high stakes, Coe’s opponent reached out towards him. Rather than striking a blow, Coe’s opponent simply poked him in the nose — handing the Tigers what proved to be the deciding match in a 5-4 victory. Even so, the strangeness of the deciding match did not make the victory any less sweet. With a more established line-up and more intense practice schedule, the Tigers are hungry. They might not be competing for national championships yet, but they are all willing to do what it takes to get there as a group. At least now they have achieved their first milestone — a victory.